Used a Color Lookup Table for the first time and found a problem. A typical project is created from a collection of .mts .mp4 and .jpg files. One group of clips was taken inside The Spinnaker Tower in Portsmouth who have kindly installed heat reflecting glass to keep visitors from frying! However this imparts a green tinge to all photos and videos which I found unattractive. I momentarily envisaged tweaking each clip/image by hand to my liking (there are over 50 of them) then realised CLUTS may provide the answer to counteract the same green tinge from every item. Not finding any ideal CLUT I found an article that demonstrated how Davinci Resolve (free) could do the job of creating CLUTs from scratch then saving them in a format compatable with PD16. It did and it was and so far all is fine. MP4 AVCHD and JPG all produced very acceptable results when CLUTed - as seen in the Editor preview. Problem only surfaced when I Produced. The MP4 bits came through fine as did the JPGs, but the mts(AVCHD) bits were a disaster and looked vary much like the 1st frame was repeated every other frame which is the only way I can describe the mess. I am Producing to MP4 just as I always do. I then went through the following sequence of tests to see what I could understand further. 6. apply CLUT to both - produce - both fine. So the AVCHD does not like CLUT - looks ok in editor and only goes bad when Produced. Q1. is there a fundamental issue with CLUTs and AVCHD? Q2. is my only solution to go through every individual mts and convert to mp4 before loading and editing? Q3. are there any other thoughts I have not asked? Wow, you've done an excellent job of diagnosing the issue on your system! It certainly looks like the issue is with mts clips. Could you please attach the CLUT you've been using, just in case there's something unusual with it? You may also want to try an existing (although less ideal) CLUT and see if you see the same behavior. Also, if you could upload a sample mts/avchd clip to OneDrive, Google Drive, etc. and post the link here, we could also see if the problem is in any way related to your source clips. I'm happy to test this on my system, but I only have PD14 and 17, so we'll certainly want other people with PD16 to give this a go. Without creating my own LUT in Resolve, I haven't been able to replicate any similar issue here. When I first got my Sony RX10iii, I shot some sample clips of the same scene on each of the video settings available... everything from 720p to UHD, from 6Mbps to 100Mbps, in .MTS & .MP4 formats. In PDR16, I just tested those clips & other .MTS sample files using various LUTs & no issues were present in preview or produced files... certainly nothing like Alan reported "a disaster and looked vary much like the 1st frame was repeated every other frame". In these screenshots, the original clip is top left & the "lutted" produced file is bottom right. That doesn't show what it does in playback, but it's silky smooth. The LUT I used in the screenshots is attached. Thank you both - some good ideas to play further with - I'm out of time tonight - but will make time sometime tomorrow. Quote Wow, you've done an excellent job of diagnosing the issue on your system! It certainly looks like the issue is with mts clips. Hi - 2 things - I tried a different CLUT heaven knows what it does but I applied it to both mts and mp4 and the same fail was seen - the mts was crucified. I hopefully have attached my original CLUT made by Resolve below. I will do mts and mp4 clips in a minute. and here for your curiosity is the disaster Produce file of a CLUT treated mts file. Thank you both - are we getting any closer? Thanks very much for the clips. Wow, the produced clip is so badly mangled it's a wonder that it even plays at all! Here's a screen capture video of what I saw. In the screen capture, I placed MediaInfo details on either side with the original clip specs on the left. The only thing I noticed is that the source clip is 25p and the produced clip is 50p, and since the video alternates between the first frame and ones playing at a normal pace, the doubled frame rate seems like a big clue. Next I opened the clip in PD, and set the project's timeline frame rate to 50 (PAL). I manually stepped through the frames one by one, and I confirmed that every odd frame is the same as the first frame, while every even frame is the actual 25fps footage of the source clip. So somehow, using this CLUT (and maybe producing to 50p) has caused PD to corrupt the produced clip (on your system, at least). Interestingly, if I set the timeline frame rate to 25, stepping frame by frame works just like it should, but if I try to play the clip, I get a yo-yo effect where it plays for several frames, them returns to the first frame, then goes back and continues from where it had been in a 50/50 split (0.5 sec of the 1st frame, then 0.5 sec of normal frames). So, I can't replicate the problem, but I'm using PD17 and I don't know how different the CLUT code might be from PD16. I even used my GPU - which in my experience - is more likely to be involved in odd behavior like this than any CPU encoding is. So maybe Tony or another volunteer with PD16 will take a crack at this. I've also put all the produced clips in this folder if you want to take a look. Until there's new information, I'd like to know if you see any changes when producing you CLUT-"enhanced" clip to 25p, setting the timeline frame rate to 25p, and producing with the "Fast video rendering technology" box unchecked. Also, it would certainly help to see the results of the DxDiag test, as described in the Read Me post at the top of the PD16 forum index. Something pretty significant seems amiss, and the more details we have, the more likely we'll figure it all out! Your comment regarding 25fps vs 50fps is interesting. Yes I have produced in 50fps for a lot of my projects as nowadays my projects consist of a collection of jpgs mts mp4 and MOV with the MOV being 30fps down to the dash cam they came from. When Produced at 25fps the 30fps bits jumped quite a bit due to the incompatability of 30fps and 25fps and I guess having to "throw away" frames to make 30 viewable at 25fps. When I Produce at 50fps the 30fps bits are much smoother and the 25fps are just as good. Movement generated by PD16 are smoother in 50fps as well. I tried this by only changing the produced file to 25fps and left everything set as normal. I tried your second point about Producing the piece at 25fps rather than 50fps and it works as expected, so we can categorically state that 25fps CLUTed MTS files Produced at 50fps will fail, and Produced at 25fps will pass. I think what I will do as a workaround and there are a couple to choose from 1) make the Tower pieces and Produce at 25fps (no dashcam in the Tower section) then the other 2 sections (pre and post Tower that do contain dashcam clips) can be Produced at 50fps for above reasons, then all three can easily be bolted together for the final project for that day, 2) convert the mts files (about 50 or so) to mp4 then rock on as normal. I am very grateful for the effort you and ynotfish have put into this issue and some interesting pointers have come to light. I am now satisfied that I have a solution to work with - we have established this is a bit of a rare one - and thats fine for me as this is the first time in a year I have ever needed to use CLUTs and may well be the last until next time I find myself in a greenhouse with tinted windows. From your experiments it might be CL have cured the issue in PD17? I'm very glad to hear you've found a workaround (especially since it only adds a couple minor steps). You may want to try disabling GPU producing, and even trying a PD-supplied CLUT just for "fun"
While it's not clear how many other people might be affected by this particular issue, I think it's a good idea to open a ticket with tech support because the produced clips are completely unusable. Be sure to include a link to this thread in the problem description. You can also post back here with the ticket number, as that has seemed helpful in closing the loop and getting issues resolved in the past. You guys have got it conquered. I used Alan's uploaded .mts file & applied Spinnaker, Clouseau & other LUTs & couldn't replicate the issue. Yes - I was producing to 25fps - not 50fps. Sure enough, when I produced to 50fps I got the same quaky mess Alan did! Produce the clip without any LUT to 50fps - no problem. That's why I couldn't replicate the issue before - I was producing 25fps clips to 25fps. Not only late, but forgetful. This LUT/MTS/FPS issue occurs in PDR16, but when the same process is followed in PDR17 there's no problem. Here's the produced file from PDR16 & here's the same thing produced in PDR17. Not only that, the LUT used is irrelevant. As optodata observed, it's the combination of LUT application & producing to 50fps. I'm unsure which clip you mean, but I think you're on the right track. Alan's original clip "16.26.37.mts" is reported in MediaInfo as 25fps interlaced with Scan Type: separated fields. His produced clip is 50fps progressive. I'm no expert, that's for sure, but it doesn't stop me trying to work things out. 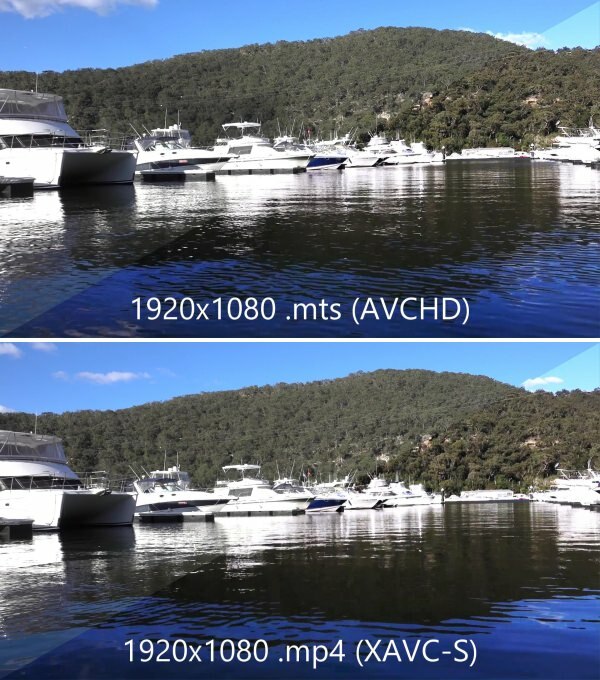 I noticed an odd thing when I ran the test on the 25fps clips from my Sony RX10iii - applying a LUT then producing to 1080/50p... one clip (00001.MTS) produced correctly (without the quake effect) and the other (00000.MTS) showed the same symptoms as Alan's. When I checked the MediaInfo the the clips they both showed 25fps interlaced BUT 00001.MTS reported "Scan Type: separated fields" & 00000.MTS reported "Scan Type: Interleaved fields". Strange that two clips from the same camera give such different results. On the timeline, what does the Set Clip Attributes | Set TV Format.. box say? I imagine it's different for each one, which I think would speak to Roland vl's point about PD's long running difficulties with interlaced clips. I can't explain this, but PDR tells me that 00000.MTS is interlaced & 00001.MTS is progressive. See attached screenshot. What about the original clips from your camera - are they different as well? I assume they will be. Also, does applying the CLUT have any impact on either of them? That would be significant. Applying a LUT makes no difference to what's displayed in TV Format. Haven't got a clue how 2 clips shot on the same camera at the same time are interpreted differently. I'll see if I can replicate that today... it's only for 1920x1080 & I usually shoot UHD on that camera.